NGO activity being largely voluntary, overheads in such organisations should be minimal. But establishment expenses are often the main reason for receiving donations from abroad. And information on fund sources and use is only rarely available, adding that as conscience-keepers who are the first to point fingers at the government it is vital that NGOs ensure their own activities are transparent. A non-governmental organisation (NGO) is any voluntary, non-profit, citizens’ group which is organised on a local, national or international level. An NGO can be registered as a society, trust or a Section 25 company, though some co-operatives also claim this label. Two important criteria are that they are supposed to be independent from the Government and they are not meant for making profit. They are also expected to be “value-based” organisations. The type of activities they are involved in is mind-boggling, and can extend from “Caring for the Aged” to “Waste Management”. 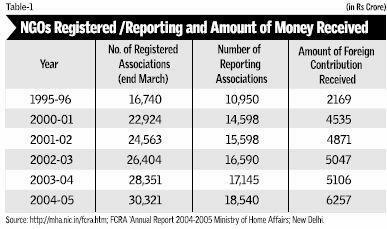 The Ministry placed 8,673 associations under “prior permission” category in 2005 for failure to furnish annual returns for three previous consecutive years. There is substantial under-reporting in the NGO segment. The report of the Home Ministry also provides other information regarding the States receiving the largest amounts, the purpose the funds were used for, etc., pertaining to the year 2004-2005. It suggests that the important States and Union Territories receiving NGO funds are Tamil Nadu (Rs 1,191 crore), followed by Delhi (Rs 1,075 crore and Andhra Pradesh (Rs 913 crore). By definition, NGO activity is voluntary and, hence, one expects that the overheads of the organisations will be minimal. In financial parlance the fixed cost is expected to be relatively very small. Contrary to this belief, establishment expenses are the major reasons for receiving donations from abroad. In other words, most NGOs seem to be becoming like top-heavy government departments, wherein a substantial portion of development expenses are spent on salary, wages and other expenses, such as telephones and travel (both domestic and international). The NGOs are active in pointing out the deficiencies in the functioning of the government, be they in the area of human rights or the Right to Information Act or the Tribes Act or regarding the dam oustees. Hence, it is all the more important that their own activities are scrupulously transparent, particularly from the point of view of their `Sources and Uses of Funds’. For instance, this writer has tried unsuccessfully to get the annual reports, including annual accounts from the Web site, of the top 25 recipients, many of whom appear often in the newspapers and TV channels to stress the importance of “transparency” in Government dealings. Their Web sites contain all the usual descriptions of their work and ideology, but nothing on their own finances. In a move designed to pre-empt any “coloured revolution” in the country, Russia recently approved a Bill that introduces stringent control over the activities of foreign-funded non-government and non-commercial organisations (The Hindu, December 26, 2005 gives the details.). It says: “The Kremlin has learnt its lessons from a string of `coloured revolutions’ in the former Soviet Republics — the `rose revolution’ in Georgia, the `orange revolution’ in Ukraine and the `tulip revolution’ in Kyrgyzstan — all inspired and orchestrated by western-funded NGOs. The Bill allows NGOs to be shut down if they threaten the country’s `sovereignty, independence, territorial integrity, national unity and originality, cultural heritage and national interests’. There are 4,50,000 NGOs in Russia representing religious organisations, charities, think-tanks, and professional groups. The US Congress has allocated $85 million for the support of democracy in Russia in 2006.” Incidentally there is an act in the US called the Foreign Agents Registration Act (FARA) and it provides for penalties up to 10 years in jail for anyone acting as a foreign agent without notification to the Attorney General. The FARA was originally passed in 1938 to prevent the spread of Nazi ideas and propaganda. `Physician, heal thyself’ is an aphorism that is, at the present juncture, highly applicable to this body of self-proclaimed saviours of the Indian masses. ← Is West ready to open the labour market?